The contribution of young and enthusiastic scientists – the leaders of the future – is central to any research endeavour. This month we launch our Centre PhD scholarship top-up program. We hope the scheme will encourage this year’s crop of chemistry, biology and physics honours students around Australia to start thinking about further research and of undertaking PhD projects with the support of the Imaging Centre of Excellence. A wide range of exciting projects is on offer, in areas that involve inventing and applying new technologies to visualise immune events in exquisite detail, and thereby understanding how the immune system can spiral out of control and developing approaches to control such aberrant events. We are continuing to build our links with industry and end users. Researchers from the Centre have been awarded two prestigious ARC Linkage grants in collaboration with Bitplane AG (Katharina Gaus) and Vaxine Pty Ltd (Jamie Rossjohn and Dale Godfrey). In addition, Adam Uldrich, a postdoctoral researcher at The University of Melbourne working closely with Dale Godfrey and Jamie Rossjohn, has won a highly competitive ARC Future Fellowship – many congratulations, Adam. Developing efficient computing techniques is a significant part of the Centre’s work. A new electron microscope (EM) running in molecular movie mode, for example, can output terabytes of data each day. Our physicists and mathematicians are working hard to meet the challenge of coping with such huge amounts of data. The goal of the Linkage grant awarded to Katharina Gaus and Bitplane AG is to develop software to interpret and analyse large data streams from light microscopes. At Monash University, our eResearch team, and in particular Wojtek Goscinski and Anitha Kannan, is developing new data harvesting technologies and analysis approaches for processing EM data. The Centre’s discoveries continue to be highlighted nationally and internationally. Most recently Associate Investigator Dr Richard Berry was interviewed on Channel 9 – complete with a quote from The Lego Movie! In the US and Europe, the summer conference season is well underway, and many Centre scientists are participating in Gordon Research Conferences and Federation of American Societies of Experimental Biology (FASEB) meetings. These get togethers are always a great highlight of the scientific year and constantly remind me of the importance of sharing current and soon-to-be-published discoveries. In such forums new and exciting scientific collaborations, as well as great friendships, are forged. Finally, while the Centre has been operating since January, it was only at the end of June that all the participating institutions and partners completed sign-off and the Imaging Centre of Excellence formally came into being. In my next newsletter I’ll have news of plans for our official launch. Please feel free to share this newsletter with interested colleagues, and do let me know if you do not want to receive future issues. David Fairlie is a hard man to catch up with – both physically and intellectually. He is so busy, his interests are so broad, and his fingers are in so many pies. The Chief Investigator and leader of The University of Queensland node of the Imaging Centre of Excellence, Professor David Fairlie is also head of the Division of Chemistry and Structural Biology at his university’s famed Institute for Molecular Bioscience where he directs the Chemistry and Human Therapeutics Laboratory. He is a National Health and Medical Research Council (NHMRC) Senior Principal Research Fellow, teaches Medicinal Chemistry and Biological Chemistry courses that he helped to establish and, in his spare time, acts as a consultant to pharmaceutical and biotechnology companies. In previous lives, David has worked at The University of Toronto and Stanford University, as well as the Australian National University and the University of New South Wales. He has published in six branches of chemistry and seven branches of biology. Researchers in his laboratory span the disciplines of chemistry and biology, from computational modelling of chemical and biological interactions, through structural and synthetic chemistry, to pharmacology, immunology, virology and clinical trials of bioactive compounds. Two recent papers (see next article) demonstrate that breadth. One outlines a study determining the smallest known molecular helix that can be stabilised by chemical linkages. It is just one helical turn. A second details research demonstrating how a receptor of the innate immune system facilitates the spread of breast cancer. Chief Investigator David Fairlie and his chemistry and human therapeutics research group at The University of Queensland have been busy publishing a couple of papers online. In Angewandte Chemie International Edition, they released details of a study to determine the smallest known helical molecule – just one helical turn – stabilised by chemical linkages. The paper compares a small array of possible linkages to arrive at the best way to lock a short peptide into an alpha helix. Their findings could enable scientists to incorporate bioactive regions of proteins into tiny helical structures that might be valuable as probes for biomedical studies. The work was undertaken in collaboration with Pfizer in the US. A second Fairlie paper, in Cancer Research, outlines how a receptor of the innate immune system facilitates the spread or metastasis of breast cancer. Metastasis is the principal cause of cancer deaths. Proteins of the innate immune system, known as complement proteins, can reduce inflammation but, in doing so, they may prepare the way for seeding new tumours. In this study of breast cancer in mice, the inhibition of an important inflammatory protein (a complement receptor) was shown to substantially reduce tumour metastasis to the lung. The work used an antagonist discovered in the Fairlie group and was led by a researcher at Texas Tech in the USA. Monash post-doc Richard Berry talked to Channel 9 in Perth about the structure of m04 immunoevasin, a member of the m02 protein family that viruses use to mimic and interfere with their host’s immune system. The work provides fundamental insight into how viruses can use these “fake proteins” to avoid detection by the immune system. The paper was published online in theJournal of Biological Chemistry. Richard and Centre Chief Investigator Jamie Rossjohn were joint senior authors. View Richard’s interview here. In addition, an April Nature paper on the precise molecular trigger of mucosal-associated invariant T cells (MAITs) was featured on the Society for Mucosal Immunology website. Meanwhile, Chief Investigator Dale Godfrey at The University of Melbourne is co-senior author with Tim Cole from Monash University of a paper reporting an investigation of the sensitivity of human immune cells to death induced by glucocorticoids (corticosteroids). Glucocorticoid-based drugs are widely used to suppress inflammation, autoimmunity and as anti-cancer agents, yet their impact on different types of human immune cells remains unclear. The paper, published in Immunology and Cell Biology, mapped out the relative sensitivity of different types of human immune cells, and showed that human B cells are particularly sensitive to glucocorticoids. Moreover, it suggests that the level of one particular promoter – the 1A3 promoter – of the gene for glucocorticoid receptors may be useful as a diagnostic indicator of sensitivity to glucocorticoid cell death. The above three Chief Investigators – senior co-author Jamie Rossjohn, as well as David Fairlie, and Dale Godfrey – have also just published in the Journal of Experimental Medicine on the molecular construction of the T cell receptors of MAIT cells. The receptors have somewhat restricted variability, but are capable of being modified and tuned by the antigens they detect. The research team included colleagues from The University of Melbourne, The University of Queensland and Monash University. Finally, associate investigator Scott Mueller has published a review in Frontiers in Immunology of what is known and not known about the roles of the T cells residing in the skin. These cells act both as a memory of past infections and a protection against those same infections in the future. The review was published with two colleagues from The University of Melbourne. Imaging Centre of Excellence Chief Investigators have been awarded two Australian Research Council Linkage grants. The successful bids are an early demonstration of the potential attractiveness of the work of the Centre to industry. Deputy Director Katharina Gaus from The University of New South Wales node has teamed up with researchers from Swiss microscopy software company Bitplane AG to work on generating algorithms to analyse images from her new super-resolution microscope. The new microscope makes it possible to record the positions of single fluorescent molecules that flicker on and off in living cells. Typically, the individual molecules are captured in about 20,000 images which are then merged into one to produce a picture of a cell that is literally constructed molecule by molecule. But that’s only half the story. The molecules depicted in the resolved image then have to be matched with biological structures such as protein complexes, membranes, the cytoskeleton, vesicles or even viral invaders. The ARC Linkage Grant will provide more than $385,000 towards writing software to generate that information. Chief Investigators Jamie Rossjohn from Monash and Dale Godfrey from The University of Melbourne have obtained $590,000 to work with South Australian vaccine company Vaxine Pty Ltd in developing and testing new synthetic compounds which will enhance our ability to understand the molecular recognition and activation mechanisms of the innate immune system’s Natural Killer T cells (NKT cells). NKT cells are triggered by lipids (fats) presented to their receptors by CD1 antigen-presenting molecules. They then proceed to produce, among other things, compounds which further activate the cells which carry the antigen-presenting molecules, thus intensifying the immune system reaction. The ultimate goal of the linkage project is to develop adjuvant compounds to modify, assist and improve this process, which is one of our first lines of defence against infection. In other words, the research should lead to improved vaccines that can be used in a generic way to treat a variety of infectious diseases. Vaxine was founded and is led by application Partner Investigator, Nikolai Petrovsky in 2002. It has already advanced into human clinical trials four improved vaccines based around adjuvant technology. They include vaccines for pandemic and seasonal influenza, hepatitis B, and bee sting allergy. 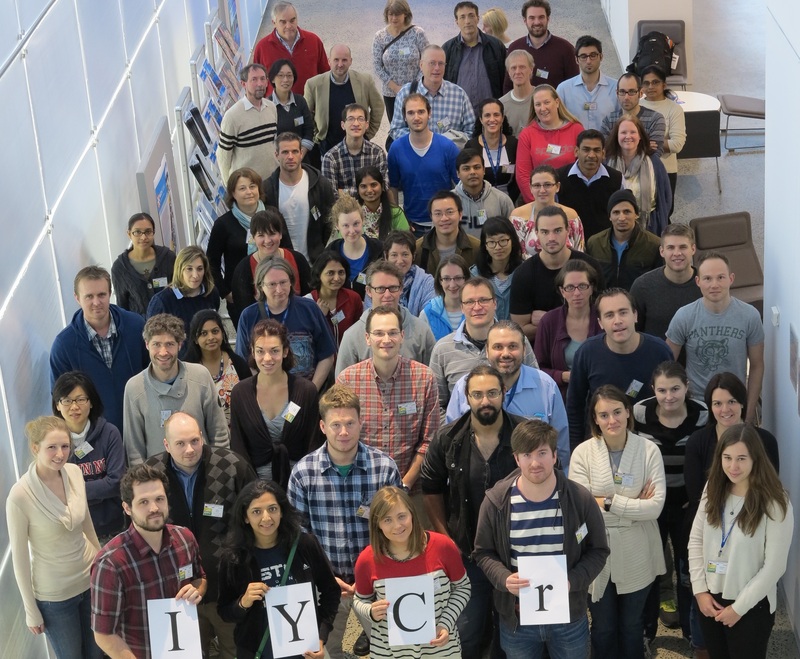 Sixty experts in macromolecular crystallography descended on the Australian Synchrotron in June for the annual Australian Crystallography Workshop. The Australian Synchrotron hosted the 2nd Australian Advanced Methods in Crystallography Workshop. Experts from Australia and overseas, including 11 from the Imaging Centre of Excellence, came together to hear about the latest modelling and processing refinements, some tricks and traps in data processing, and how new tools could transform them from newbies to old pros. As well as exploring state-of-the-art macromolecular crystallography, 24 attendees had a hands-on opportunity to use the new methods on beamlines at the Australian Synchrotron, and 30 stayed an extra day to hear about developments in Lipid Cubic Phase (LCP) crystallisation. All 60 enjoyed a typically chilly, Melbourne-in-June BBQ, and a toastier workshop dinner. The Centre was a major sponsor of the workshop, and the Centre’s Associate Investigator Dr Stephanie Gras, of Monash University, one of the organising committee. Over 40 top-up scholarships will be awarded between 2014 and 2020. The Centre aims to provide an unprecedented understanding of how immunity works and to pioneer the next generation of imaging at the atomic, molecular, cellular and whole animal levels. access state-of-the-art research facilities here and overseas. Imaging Centre of Excellence researchers continue to share the Centre’s achievements with the global research community – presenting in Italy, Poland and the USA. Centre Director James Whisstock was in Lucca, Tuscany, at the end of June, chairing a Gordon Research Conference on Proteolytic Enzymes and their Inhibitors. Before returning to Australia, James stopped in Poland to speak at an infection and immunity workshop at Jagiellonian University, Krakow. At the end of June, Centre Deputy Director Katharina Gaus from UNSW discussed single molecular localisation microscopy at the 9th International Weber Symposium on Innovative Fluorescence Methodologies in Biochemistry and Medicine in Kauai, Hawaii and at the 5th International NanoMedicine Conference in Sydney. Late in July, Chief Investigator Jamie Rossjohn delivered a paper in San Diego to the 28th annual Symposium of the Protein Society on his work on mucosal-associated invariant T cells (MAIT cells). Jamie’s paper discussed immune sensing of vitamin B metabolites. Hannah Coughlan, a second-year PhD student in Chief Investigator Brian Abbey’s group at La Trobe University, presented a seminar on coherent biological imaging techniques at the JILA institute, Boulder, Colorado in late July. Two July talks at the Asia Centre in Melbourne gave the public insights into some of the science behind Imaging Centre of Excellence projects. Chief Investigator Harry Quiney explained how new developments in X-ray crystallography promise to revolutionise materials science and structural biology. And a week later, Partner Investigator Andrew Peele explained how the Australian synchrotron works, and its application to biotechnology, industry and life-saving technology. These talks were part of a University of Melbourne physics lecture series. establishing a strong, nationwide, outreach program, with a focus on communicating our scientific discoveries to key stakeholders and the general public. Collaborating Organisations: La Trobe University, The University of Melbourne, The University of New South Wales, The University of Queensland. Partner Organisations: Australian Nuclear Science and Technology Organisation, Australian Synchrotron, Carl Zeiss Pty Ltd, Deutsches Elektronen-Synchrotron, Germany, Leica Microsystems Pty Ltd, University of Warwick, UK.